The Almalyk porphyry Cu-Au system, located adjacent to the town of Almalyk, 65 km to the southeast of Tashkent in eastern Uzbekistan (#Location: 40° 48' 44"N, 69° 38' 49"E). The complex encompasses the ore deposits at Kal'makyr (2.5 Gt @ 0.38% Cu, 0.5 g/t Au) and Dalnee (2.8 Gt @ 0.36% Cu, 0.35 g/t Au). 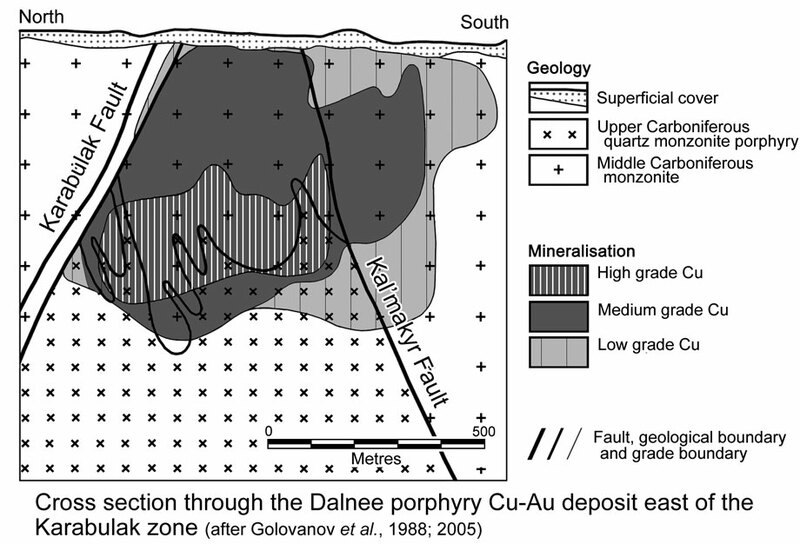 The Sarycheku orebody (200 Mt @ 0.5% Cu, 0.1 g/t Au) is part of the Saukbulak porphyry Cu-Au system, some 18 km to the south (Seltmann and Porter, 2005). Seltmann (2012) quotes a total resource for the complex of 8 Gt @ 0.58% Cu, 3 g/t Ag, 0.5 g/t Au, 0.005% Mo. Both systems are associated with the second, Middle- to Late-Carboniferous, pulse of magmatic activity within the Devono-Carboniferous Valerianov-Bel'tau-Kurama volcano-plutonic belt that is the main element of the Middle Tien Shan terrane in Central Asia. Previous K-Ar dating of the ore-related porphyry intrusive and the mineralisation has returned ages in the range of 310 to 290 Ma, whereas recent U-Pb zircon dating reported for the intrusive sequence in the Almalyk district partially overlaps in the range of 320 to 305 Ma, with Re-Os ages of ore-related porphyries of 315 to 319 Ma (U-Pb and Re-Os age dating from Seltmann and Porter, 2005). More recent dating has yielded an age of 327.2±5.6 Ma for the ore-hosting monzonite and 313.6±2.8 Ma for the ore-bearing granodiorite porphyry (zircon U-Pb; Zhao et al., 2017). Seven molybdenite samples from stockwork and veinlet ores yielded model ages from 313.2 to 306.3 Ma (Re-Os; Zhao et al., 2017), with two well constrained isochron ages of 307.6±2.5 Ma (5 stockwork samples) and 309.1 ± 2.2 Ma (5 stockwork ores and 2 veinlet ores), respectively (Zhao et al., 2017). These results indicate that Cu–Au mineralisation post-dated the emplacement of the monzonite, started immediately after the emplacement of the granodiorite porphyry, and lasted for ~7 Ma thereafter. Geochronological and geochemical data suggest that the Kalmakyr deposit was formed in a late Carboniferous mature magmatic arc setting, probably related to the latest subduction process of the Turkestan Ocean beneath the Middle Tien Shan (Zhao et al., 2017). Mineralisation at both Kal'makyr and Dalnee is predominantly in the form of stockworks with lesser disseminations, and is associated with Late Carboniferous quartz monzonite porphyry plugs intruding earlier dioritic and monzonitic intrusive rocks of the same magmatic complex. The orebodies take the form of a cap like shell developed above and draped over the flanks of the related quartz monzonite porphyry stock. The dominant hosts to ore are the monzonite and diorite wall rocks, with the quartz monzonite porphyry only containing ore in its outer margins, surrounding and/or overlying a barren core. The focus of stockwork development is fracturing related to both the intrusive contact of the porphyry stock and to crosscutting faulting. Alteration comprises an early K-silicate phase followed by albite-actinolite and peripheral epidote-chlorite-carbonate-pyrite propylites, overprinted by an abundant phyllic episode which is closely related to the final distribution of the ore.
Associated mineralisation commenced with barren quartz-hematite veining, followed by quartz-magnetite, quartz-pyrite-molybdenite-chalcopyrite with the bulk of the contained gold, quartz-carbonate-polysulphide with lesser gold, then by zeolite-anhydrite, and finally carbonate and barite veining. Subsequent oxidation and uplift developed a layer of oxide ore, a limited leached cap and supergene sulphide enrichment, largely in zones of fault related fracturing. The Kal'makyr deposit is distributed around and within the outer margins of a central plug of Late Carboniferous quartz monzonite porphyry (QMP) intruding earlier Carboniferous monzonite and diorite. The deposit straddles a major fault and extends southwards toward a second fault zone. The main volume of the block defined by these two faults is occupied by monzonite and diorite, although remnants of Devonian volcanic and carbonate rocks are locally preserved. Approximately 65 to 75% of the ore at Kal'makyr occurs in the form of stockwork veins and veinlets, while 30 to 35% occurs as disseminations. The distribution of the ore stockwork and the intensity of veining is controlled by the density of fracturing and brecciation related to both the intrusion of the QMP stocks and dykes, and to linear fracture zones associated with the Kal'makyr and Karabulak faults. As a result, the stockwork is represented by a downward expanding cone surrounding and capping the quartz monzonite porphyry plug, with a barren core corresponding with the centre of the plug. The stockwork is represented by a network of fractures which have been healed by quartz veinlets, and less frequently by calcite or anhydrite, which contain large segregations of the ore sulphides, including pyrite, chalcopyrite, chalcocite, pyrrhotite, molybdenite and tetrahedrite. The veinlets vary in thickness from fractions of a millimetre to 3 or 4 cm, and are from a few to a few tens of centimetres in length. The interval between the veinlets if occupied by lesser disseminated pyrite, chalcopyrite, magnetite and occasionally other sulphides. 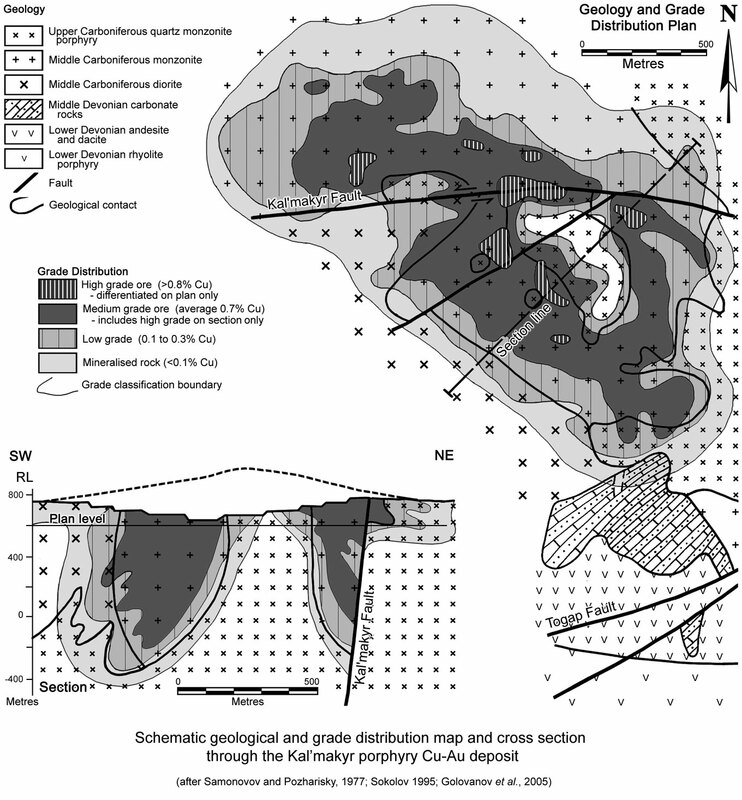 The stockwork zone is elongated in a northwest direction, with maximum surface dimensions of approximately 3520 x 1430 m and a maximum vertical extent of 1240 m. The inner annulus of high-grade ore is substantially smaller, with outer dimensions of approximately 1740 x 500 m and a maximum vertical thickness of 450 m. The most intense fracturing and the highest grade ore are related to the intersections of porphyry contacts with the east-west and northeast trending faults and tend to form a broken annulus within the monzonite and diorite wall rocks immediately surrounding the QMP. The grade rapidly decreases inwards to the barren core in the QMP plug. In contrast the high grade annulus is surrounded by a broad halo of medium grade ore before passing into a lower grade periphery. At depth the ore stockwork becomes less continuous and lenses-out downwards via a series of tongues. The primary Kal'makyr ore contains Cu, Mo, Au, Ag and admixtures of Se, Te, Re, Bi and In. The upper sections of the ore deposit were subjected to oxidation and supergene enrichment, best developed in areas of more intense fracturing on the QMP contacts and along zones of fault related fracturing. The degree of oxidation, leaching and supergene enrichment varied across the deposit, from oxide to secondary sulphide to mixed oxide-sulphide zones, although the supergene sulphide enrichment was only weakly developed. Oxidation was developed to a maximum depth of 65 m, averaging around 20 m, while leaching, where it replaced in situ oxidation, persisted over a similar thickness. The principal mineral within the oxide zone was malachite, with chrysocolla and turquoise being locally important. 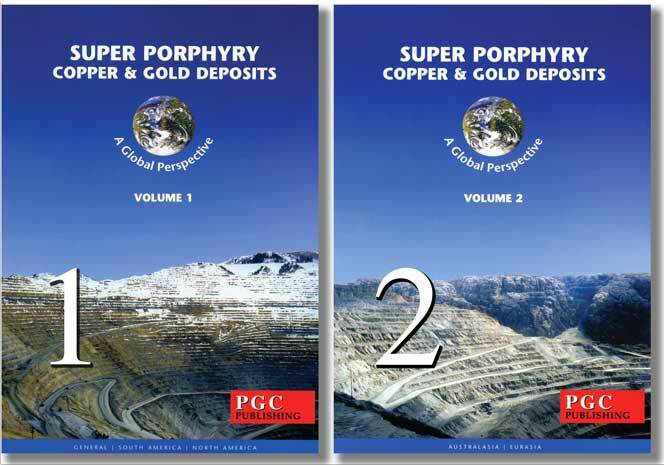 Where present, supergene sulphide enrichment, principally as chalcocite and covellite, had a maximum thickness of 70 m, averaging 19 m, while a mixed 'complex' oxide-supergene sulphide zone, where developed, also averaged 19 m in thickness. The εHf(t) values of zircon grains from the monzonite vary from +11 to +1.7, averaging +5.1, whilst those of zircon grains from the granodiorite porphyry range from +5.7 to -1.8, averaging +2.4 (Zhao et al., 2017). These data suggest the magma of both intrusions was derived from partial melting of a thickened lower crust with mantle input and variable crustal contamination, and that there was a greater mantle contribution to the monzonite than the granodiorite porphyry. High concentrations of 98 to 899 ppm rhenium in molybdenite, also indicate a major mantle contribution of rhenium, and by inference, ore metals (Zhao et al., 2017). The relatively high EuN/Eu*N values (average 0.68), Ce4+/Ce3 values (average 890) and Ce/Nd values (average 36.8) for zircon grains from the granodiorite porphyry than those from the monzonite (average EuN/Eu*N = 0.33, average Ce4+/Ce3 = 624, average Ce/Nd = 3.9) suggest that the magma for the syn-mineralisation granodiorite porphyry has a higher oxygen fugacity than that for the pre-mineralisation monzonite (Zhao et al., 2017). Based on these data, Zhao et al. (2017) proposed that the oxygen fugacity and volatile contents in the magma were relatively low during emplacement of the monzonite, and ore metals would be dispersed in the intrusive rock, whereas when the granodiorite porphyry was emplaced, the oxygen fugacity and volatile contents in the magma were increased, favouring copper and gold enrichment in the magmatic fluids. The Dalnee group of deposits are a west to northwest, down-plunge continuation of Kal'makyr at deeper levels. 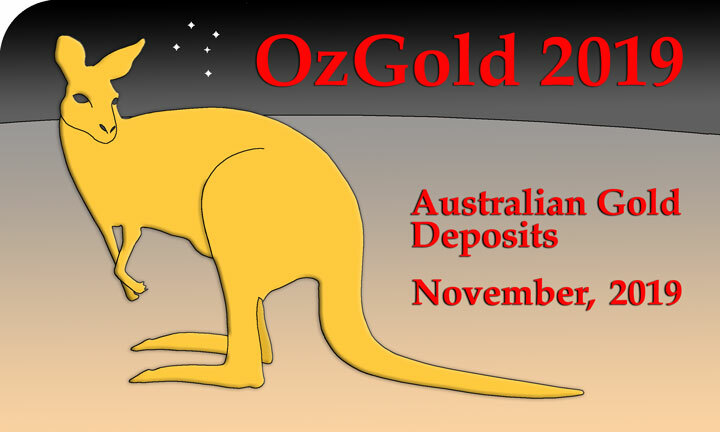 The >0.1% Cu outline unites these deposits into a common ellipsoidal sub-economic mineralised mass in plan view. However, post-mineral normal and sinistral strike-slip displacement on both the Karabulak and Kal'makyr faults dissected the ellipse into three blocks. The northern Karabulak block is displaced by 2 km to the west and the Central block (the main Dalnee deposit) for 0.5 km to the west of the southern block and Kal'makyr. The northern block encompassing Karabulak is the least eroded, while the deepest exhumation has affected the southern block and Kal'makyr. The main Dalnee deposit in the Central area is located within a downward widening tectonic wedge between the Karabulak and Kal'makyr faults which have truncated the mineralised system and displaced ore on the flanks of the underlying QMP. Approximately 58% of the ore in the deposit is hosted by the monzonite, 35% by the diorite and 7% by the QMP. The stockwork is elongated parallel to the east-west direction of faulting and widens downward due to the outward dip of the bounding faults, while the base of mineralisation closely follows the apical surface of the underlying QMP stock. The average vertical extent of mineralisation is about 700 m with a maximum of 1200 m on some sections. The higher grade Cu mineralisation occurs below a depth of 150 to 200 m, while the highest grade core is at a depth of 500 to 600 m. The Karabulak deposit to the north is the least economically important of the Dalnee deposits. Drill holes intersected 'high-grade' Cu mineralisation extending along the Karabulak Fault at depth, associated with a small stock of quartz monzonite porphyry (QMP). The Sarycheku deposit is related to the hanging wall of the Miskan Fault, with the ore grade mineralisation being confined to the tectonic wedge between the Miskan and Sargalam faults. The host rocks are represented by Devonian rhyolite porphyry, which is cut by Late Paleozoic porphyry intrusion. The oxidised and chalcocite ores have virtually been exhausted, while the underlying hypogene sulphide ore is concentrated within a zone which is 1160 m long and has been traced to a depth of 340 m.
This summary is drawn from Seltmann and Porter (2005). Cheng, Z., Zhang, Z.-C., Turesebekov, A., Nurtaev, B.S., Xu, L. and Santosh, M., 2018 - Petrogenesis of gabbroic intrusions in the Valerianov-Beltau-Kurama magmatic arc, Uzbekistan: The role of arc maturity controlling the generation of giant porphyry Cu-Au deposits: in Lithos v.320-321, pp. 75-92. Dolgopolova, A., Seltmann, R., Konopelko, D., Biske, Yu. S., Shatov, V., Armstrong, R., Belousova, E., Pankhurst, R., Koneev, R. and Divaev, F., 2017 - Geodynamic evolution of the western Tien Shan, Uzbekistan: Insights from U-Pb SHRIMP geochronology and Sr-Nd-Pb-Hf isotope mapping of granitoids: in Gondwana Research v.47, pp. 76-109. Gao, J., Klemd, R., Zhu, M., Wang, X., Li, J., Wan, B., Xiao, W., Zeng, Q., Shen, PO., Sun J., Qin, K. and Campos, E., 2017 - Large-scale porphyry-type mineralization in the Central Asian metallogenic domain: A review: in J. of Asian Earth Sciences Available on-line from October 18, 2017, 30p. 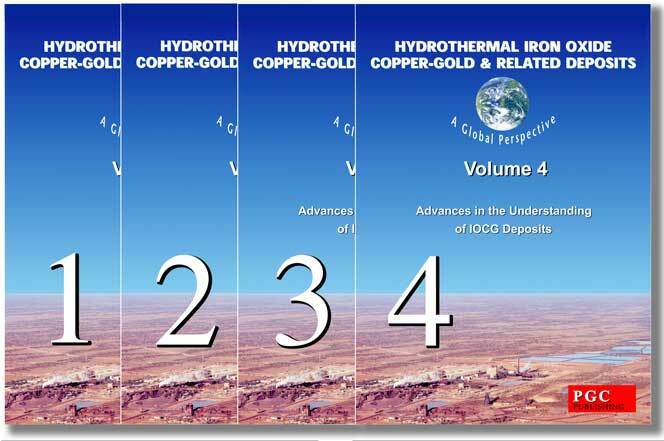 Gao, J., Qin, K., Zhou, M.-F. and Zaw, K., 2018 - Large-scale porphyry-type mineralization in the Central Asian Metallogenic Domain: Geodynamic background, magmatism, fluid activity and metallogenesis: in J. of Asian Earth Sciences Online, https://doi.org/10.1016/j.jseaes.2018.08.023. Seltmann, R., Porter, T.M. and Pirajno, F., 2014 - Geodynamics and metallogeny of the central Eurasian porphyry and related epithermal mineral systems: A review: in J. of Asian Earth Sciences, v.79, pp. 810-841. Shen, P., Pan, H., Hattori, K., Cooke, D.R. and Seitmuratova, E., 2018 - Large Paleozoic and Mesozoic porphyry deposits in the Central Asian Orogenic Belt: Geodynamic settings, magmatic sources, and genetic models: in Gondwana Research v.58, pp. 161-194. Wan, B., Xiao, W., Windley, B.F., Gao, J., Zhang, L. and Cai, K., 2017 - Contrasting ore styles and their role in understanding the evolution of the Altaids: in Ore Geology Reviews v.80, pp. 910-922. Zhao, X.-B., Xue, C.-J., Chi, G.-X., Mo, X.-X., Bakhtiar, N. and Zhang, G.-Z., 2017 - Zircon and molybdenite geochronology and geochemistry of the Kalmakyr porphyry Cu-Au deposit, Almalyk district, Uzbekistan: Implications for mineralization processes: in Ore Geology Reviews v.86, pp. 807-824. Zhao, X.-B., Xue, C.-J., Chi, G.-X., Mo, X.-X., Nurtaev, B. and Zhang, G.-Z., 2017 - Zircon and molybdenite geochronology and geochemistry of the Kalmakyr porphyry Cu-Au deposit, Almalyk district, Uzbekistan: Implications for mineralization processes: in Ore Geology Reviews v.86, pp. 807-824.